We had earlier reported that Tata cheapest car Nano is having a next gen upgrade and will be launching soon, the time has come to unveil the GenX Nano Easy Shift to the crowd on May 19. The bookings are already being accepted at Tata showrooms after the news of Tata Nano GenX was revealed at Tata Motors official Facebook page. The Tata GenX Nano Easy Shift will take out the monotonous drives around the city using your clutch in peak traffic. 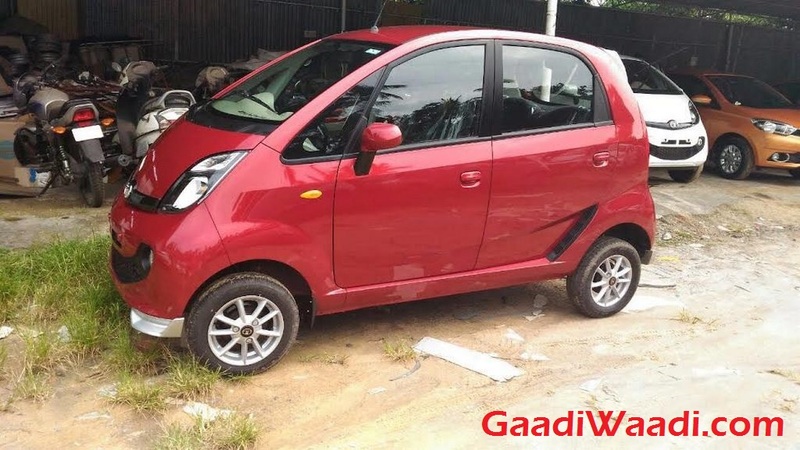 Do you think Tata’s aim to launch the cheapest car and have an AMT version installed in it with few cosmetic changes and have it priced among the regular car makes it no cheapest car anymore? Let us know your opinions in our comment box below. Meanwhile, enjoy reading our article on the Tata GenX Nano Easy Shift. First, talk about its cute smile. Tata has managed to keep the smile on the Nano earlier and now as well. However, now the smile comes with fog lamps ending on both ends. Within the smile you will notice Infinity motif design theme, which we think it to describe the GenX Nano as without any limit. And yes, there is no limit to the Nano, I personally have chased down a couple of kms in a Nano. I felt it was pretty good with a descent handling nature, the only thing I felt was missing was a roll cage just to be safe inside, this is also now fixed in the Genx with Anti Roll Bar for high speed stability, I believe so, if it actually does its job. There is no change to its power delivery unit, it is still powered by the 2 cylinder 624cc engine that offers just 38PS power and 51 NM torque with a change in the gearbox Easy Shift (Automated Manual Transmission) with Sports Mode. Will it kick some dust? Yet to be seen. The drive would be more hassle free with the EasyShift and ePAS (electric Power Assisted Steering), we vote for that! The GenX Nano offers a proper 110Litre boot space now, unlike the earlier version hardly any space to keep a carry bag. At the interior the dashboard and quality of the material has been revised to offer best in class look and feel within. To engage more customers to buy the new Nano, Tata Motors is presenting, the Power of 1+1 program where the company is offering ₹20,000 as a special exchange bonus with best exchange rate guarantee for buying Tata Nano Genx and also has introduced a customer referral program with cash reward upto ₹5000 for each referral for Tata customers.